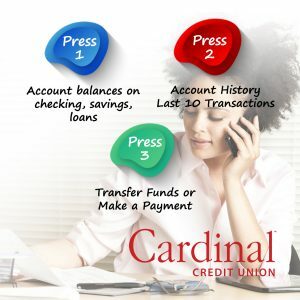 When using Cardinal’s Telephone Banking for the first time, have your member number handy and the last 4 digits of your Social Security Number. The system will then guide you through the process of choosing a new access code. Change your access code to a 4 digit number that only you know. Note: Your new access code cannot start with a zero. Ability to transfer funds between eligible Cardinal accounts within the same membership. You have the option to use “Touch Tone” button commands or Voice Recognition. Press 8*, at any time during the call, to switch to the voice recognition mode. To learn more, visit our Telephone Banking help page. Your savings insured to $250,000 per account. This institution is not federally insured.